I'm not sure why I'm as fond of Faith now as I am. It remains the drama I'm most excited to watch each week, even though I keep peeking at the clock while I'm watching. Truthfully, it's not all that fun to sit through, as our characters have been behaving dully and the plot is suffering from the expected repetitiveness of a 24-episode run. I think it's my lingering hope that it'll somehow get better, and my still-strong goodwill for the two leads. Neither Choi Young nor Eun Soo have been all that great lately, but there's always flashes of the earlier qualities that made me love them (Eun Soo's humor and CY's broody coolness). These two still have sparkler-loads of chemistry, and their scenes almost always manage to surmount the poor directing and make me feel gleeful and entertained. Unfortunately, what's not so entertaining is everything else. The politics, the back-and-forth negotiations, the poisonings, even the King and Noguk. The story just slows precipitously in those moments, made all the worse by a TERRIBLE director. Watching Faith alongside Nice Guy just makes the horrible scene-cutting and cheap camera all the worse. It's especially apparent when I try to take screenshots. I'm not feeling much for any of the baddies. 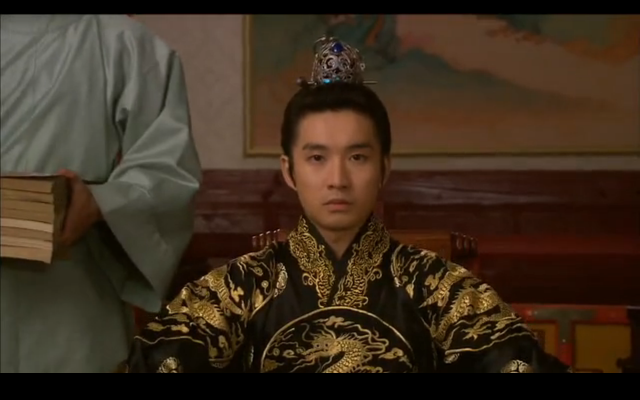 Ki Chul is becoming wearisome, his lackeys are boring as dust, and King's bro is simply annoying. Now we're apparently adding Yuan to the mix, and I want it to just stop and focus on our leads instead. The love story and the incongruity of adapting to the past were always at the heart of the story, and it's silly to watch it weave ever further from that. What really kills me is how useless Eun Soo is getting with each progressive episode. She went from fiery and funny to mopey and teary. I get that it's hard to be stuck in the past, but I wouldn't have thought her weak enough to so quickly fall in spirit and personality. Yes, I'm sure it's rough to see people die, but she was a surgeon and should rightly have seen her share of deaths. It's also not like nobody ever gets murdered in the modern day. I'm disappointed at this turn, even if I still retain fondness for her. As for the love story itself, I sadly think it missed out on some huge potential. We kind of skipped over the whole why Choi Young fell for her. Yes, she's a crack-up and saved his life, but he knew all that earlier on. What was the trigger that led from mere curiosity and obligation to this passionate love? Yes, we do get hints even from episode 2 that he was drawn to her, but I'd think it'd take more than a pretty face and a strange attitude to draw out someone like him. So why? And finally, my thoughts on the kiss - it took long enough! I guess the production may have been nervous considering the 10-year gap and Kim Hee Sun's married status, but really, there's no need to delay the inevitable. It was nice, as LMH kisses hardly disappoint. But it was also very tame, and we can see the actors clearly holding back, though whether that's on purpose or due to personal nervousness isn't clear. I'd really like to see a more passionate kiss in the future, but won't hold my breath for it to happen. I'd also like to see Eun Soo advance their relationship in a more modern way, but again probably won't happen. Here's to hoping the ending doesn't disappoint, and that somehow we're able to skip over the whole mess with history issue and get our happily ever after. My theories? 1) that Eun Soo not only skipped to the past, but also skipped to a different dimension (or version of reality) where Choi Young doesn't necessarily have to live in til he's 70, thereby allowing him to leave with her to the future. The "future Eun Soo" may actually be a time-skipping Eun Soo from yet another dimension (e.g. that Eun Soo came from another dimension of the future but landed in the same past dimension she's in, but further back). Confusing yes, but borrowed from some theories from stories I've read previously. And this would allow us a true clincher at the end! 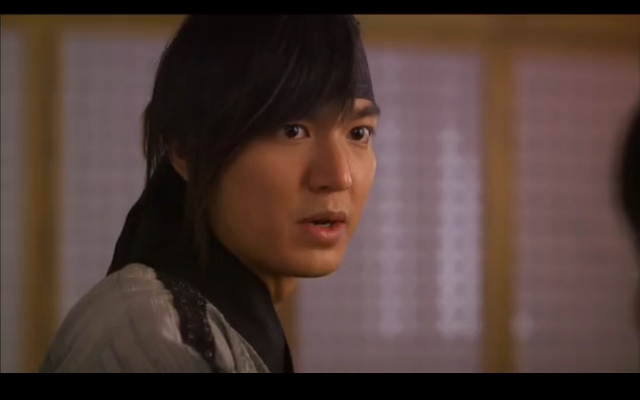 2) Eun Soo stays in past with Choi Young and lives with him til he dies as planned. My obvious preference would be for him to come to the future, but time travel shows seem to have a huge bias against this. I don't think I've ever seen this execution (except in Jade Palace and In-Hyun), as usually the heroine has to stay in the past to live her happily ever after (Bu Bu Jing Xing, Inuyasha, a million other time-travel movies). It's lame and stupid, as WHY WOULD YOU STAY IN AN ERA WHERE THE FLU CAN KILL YOU? Anyways, I've liked Faith's story so far, and I hope it manages to keep up its flow of logic to a strong conclusion.